National RF's Type HFDX Vector-Beam is an active table-top HF directional antenna that can be used to reduce or cancel man-made noise or other interfering stations. The antenna system consists of a high gain RF amplifier coupled to a tunable Faraday shielded loop antenna element. 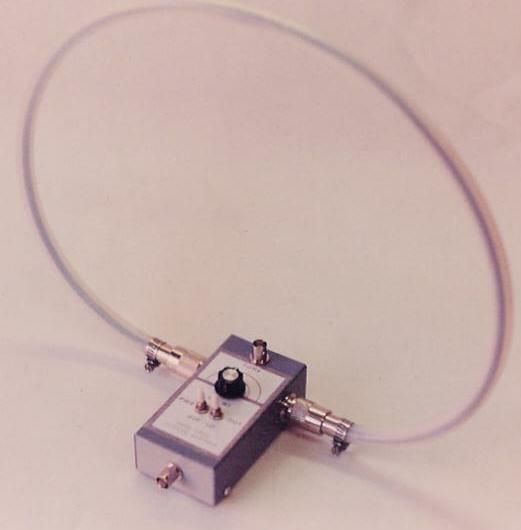 Several loop elements are available to provide coverage of frequencies in the HF spectrum. Due to the nature of a Faraday shielded loop, the antenna exhibits a sharp null through the diametric center of the loop. This null can be used to advantage to reduce or eliminate interfering stations by rotating the antenna. The undesired signals will be reduced in strength by the null notch, thus allowing better reception of the desired signal. The internal high gain amplifier is used to compensate for the inherent inefficiency of the actual loop at the operating frequency. Overall, the system dynamic response is about +6 dB as compared to the dynamic response of the dipole. A standard BNC female connector is provided to allow interface with virtually any communications or shortwave receiver. A single 9-volt battery is required for operation. The battery and the HF radio receiver are the responsibility of the customer to provide. Antenna Type: Amplified Faraday shielded loop with bi-directional, cardiodal pattern response.